There's been a lull. For nine days now I've done nothing. Nada. Haven't run a mile, or cycled or even played hopscotch outside the parish hall (not that I ever did that). And why? Have I been injured? - No. Busy at work? - No more than usual. Any excuse then? Not a one. The Con Job and I Beat the Elements. What a difference a day makes - this glorious pic was taken only yesterday, down at Trá na Reilige. Slight Slippage but Keeping it Going..
Not a great week - especially when taken in the context of the past few weeks when I was well and truly motoring in training. This Tuesday I did some interval training, but couldn't manage the required amount from my Furman schedule. I had to pass on the tempo run on Thursday and didn't do my full long run today. The body just needed a pair back I reckon - a recharge of batteries and some muscular rebuild (that's my story anyway and I'm sticking with it!). Hopefully next week will be a bit better - I have Monday off and am hoping to do a 13miler. Meanwhile, I have nothing to practice as regards my showboating style finishes to races - as the pic below shows! 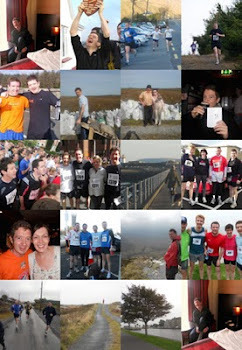 Run a Month Boys do the Conamara 10k! It's been a week since my last entry, but far from being a neglectful runner, I've actually had a good week's training. It consisted of : intervals on Monday, tempo run on Wednesday and then the long weekend run. 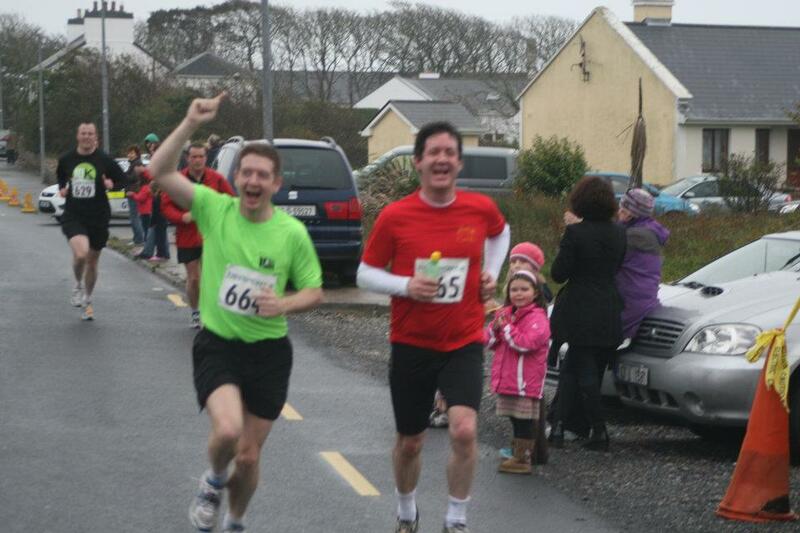 This weekend saw my own club's big event - the Conamara 10k - held in Carna, give myself and Kevin (the Run a Month Club!) an opportunity to click our 10th month. The day was a bit drizzly and dark to start off with, but by the time the race got underway it turned, well, just a little less drizzly and dark! Kevin and I started and finished together, again, and this time we finished just a few seconds outside the 53min mark! The course was very scenic - starting off outside of the Connemara Bay Hotel in Carna and then winding it's way around the outskirts of this gorgeous village. There were hills - but they also went downward! Full credit to the lads in the club who organised this event - including the oft mentioned Big Ron! - it was a really fun day out and well geared for families. We were all thrilled to hear some advice from the great Caitriona McKiernan (former Cross Country Champion) after the race. The other great thing about a local race is that friends are met that are rarely seen these days (due to mundane adult responsibilities). One such friend was Aideen, who finished the race in 47mins and is in flying form. On another, unconnected matter: our poor rugby lads lost this morning to Wales in the world cup... pity for them. They should, however, hold their heads high for one particular reason: they just may have fostered a new habit in Irish people, that of getting up at 5.30am - now this could lead to a healthy and productive economy???! 12 Miles on the Old Ardee Road. I was in the Wee County this weekend and decided that a good long run with a wholesale change of scenery with be just the thing for me. I'm now following the Furman First Half Marathon Training Programme, and have dipped straight in to week 11 of 18. My aim is to set a PB for the Waterford Half Marathon on December 10th, to finish off my 'Run-a-Month' project on a high. This sounds more difficult that it is - my old PB is just 1.56mins, and was set back in the days when I used to have beer for breakfast (slight joke). I had company for some of my weekend run - Benny came three miles with me, and ended up doing a very creditable six himself. The old Ardee road is a very pleasant run - not much traffic and enough ups and downs to keep a body on it's toes. I felt great throughout and kept a very steady pace of about 8.40mins. Of course it rained, and rained, and rained... but that mattered not a hoot while I was out in it. The good thing is that I'm hitting a wee bit of form at last - and what better place to start hitting a wee bit of form than up in the wee county!